The Chison ECO5 is an affordable option for those looking for Doppler ultrasound capabilities and advanced imaging options at an affordable price. Although it’s one of the lower-priced Doppler systems on the market, the ECO5 still delivers incredible image quality thanks to advanced imaging capabilities. Packed with features like speckle reduction imaging, tissue harmonics and compound imaging, the ECO5 is an affordable way to achieve crystal clear image clarity. The ECO5 is also a highly versatile system, with measurement packages for abdominal, basic cardiac, OB/GYN, pediatrics, small parts and vascular imaging. The ECO5 also features a rectal linear probe, which delivers better viewing of the prostate when compared with standard convex endocavity transducers. This system includes a 12-inch LED monitor for high resolution images. Unlike other Doppler systems in this pricing category, the ECO5’s monitor also includes a wide viewing angle, with the flexibility to tilt the screen up to a 30-degree angle. The system is also incredibly portable, making it the perfect addition to any busy medical setting. 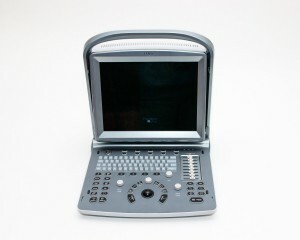 If you are looking for the lowest price on a refurbished Chison ECO5, UsedUltrasound.com is the place to find it. UsedUltrasound.com has a complete inventory of used Chison ultrasound machines for sale, all backed by a 100% satisfaction guarantee. To receive a no obligation Chison price quote, simply fill out the contact form below.